CSV stands for "Comma Separated Values". In computing, a CSV file is a delimited text file that uses a comma to separate values. A CSV file stores tabular data in plain text, with each row representing a data record. A record can consist of one or multiple fields, separated by commas. The most common programs for viewing, editing and using CSV files are Microsoft Excel and Google Sheets. Upload the CSV file you'd like to split and choose whether you'd like to copy header rows into each file. That's it. 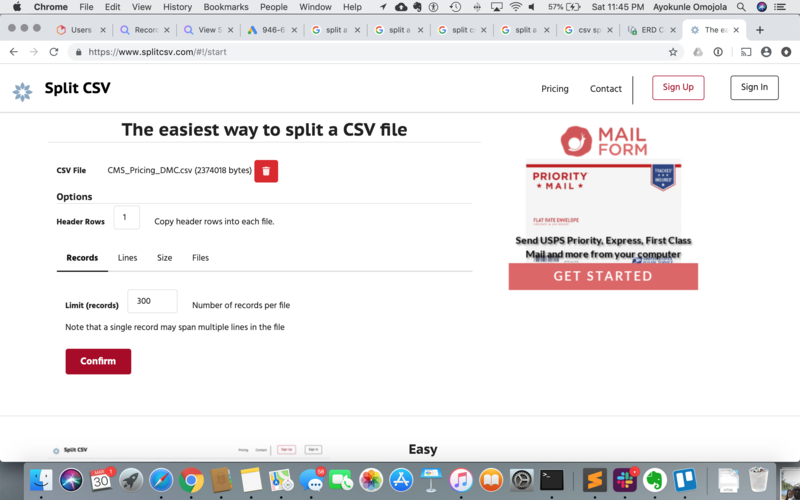 You can easily split a CSV of any size, no matter how big, no signup or payment necessary. SplitCSV.com is a free CSV splitter - we'll email you once it's ready. If you have questions, comments or concerns, please email team@splitcsv.com.